We’re Ralph and Carol Lynn Rivera, a husband-wife team in life and business. 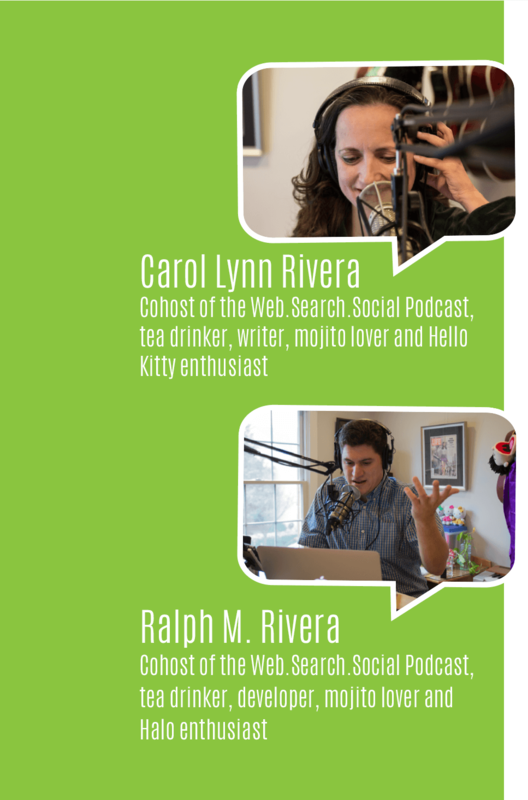 We’re cohosts of the now-retired Web.Search.Social Podcast, which has been rebranded as Carbon Based Business Units. We love tea, movies, mojitos, cigars and most of all we love podcasting. We also run three businesses and occasionally like to eat and sleep, so it’s important for us to work smart. …like hunting down guests and reminding them of their recording dates (and rescheduling when they forgot). We also spent a ton of time promoting our show because when we got busy and didn’t promote it, we got fewer listens. And we’d stare sadly at our older episodes and wish we had time to keep promoting those, too. …and built a suite of tools to help us get things done faster, make our lives easier and give us more time to do what we really love, which is get on the mic and talk to our audience. We want it to help you manage your podcast the way it’s helped us, and free you up to focus on what’s important to YOU – like creating great content, monetizing, interacting with your audience and more. We invite you to give it a try and see how it can help make podcasting more fun. Book one, two or more guests with a scheduling tool that feeds right into your calendar. Automate outreach and follow-up so you never have to wonder if your guests will remember to show up for a recording session, or nag them to help you promote their episode again. We give you the tools to find and connect with other podcasters, share opportunities, build communities, and grow a network of like-minded podcasters who can help you cross-promote. You’ll even be able to manage outreach to listeners so you can turn them into raving superfans. From outlining an episode topic to writing show notes, we help you get organized so everything you need is accessible from one location. Never wonder where the heck you put your notes or what happened to your iTunes cover again. Podcaster’s Toolbox is currently in beta. Our faithful testers are offering suggestions and kicking the tires before we launch into the wild, so sign up here to be the first to know as soon as we’re open for business. You’ll get a free 15 day trial with no commitment and zero risk! Enter your email below and see just how easy it can be to plan, produce and promote your podcast so you can get back on the mic! What's your biggest podcast challenge that you wish Podcaster's Toolbox would solve?